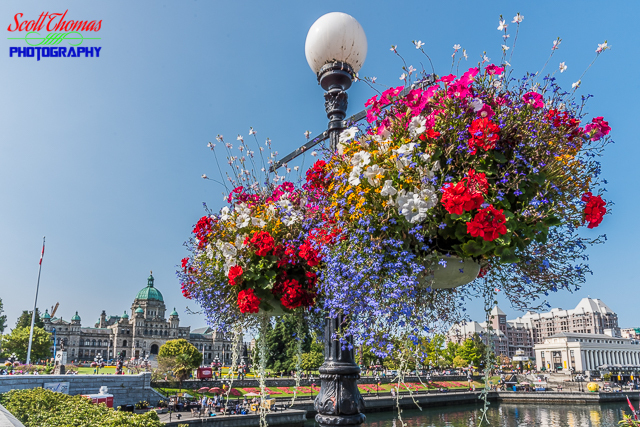 Two of over 1300 hanging flowers in the City of Victoria, British Columbia, Canada. Nikon D750/24-120VR, 1/125s, f/16, ISO 250, EV +0.3, 24mm Focal Length. My wife and I took the Black Ball Ferry from Port Angeles, Washington to Victoria, British Columbia in Canada and enjoyed a day in the beautiful city. One of the first things we noticed were all the hanging flowers on the lamp posts. Found out later there are over 1,300 of them throughout the city. 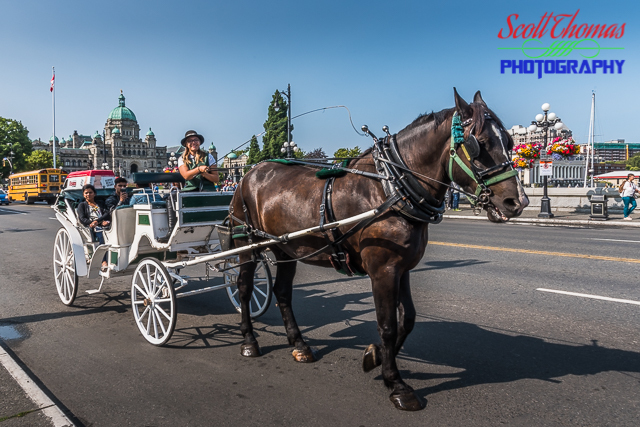 Tourists taking a tour of Victoria, British Columbia, Canada in a horse drawn carriage. Nikon D750/24-120VR, 1/125s, f/16, ISO 220, EV +0.3, 24mm Focal Length. A popular way to see Victoria is to hire one of the horse drawn carriages found near the harbour and Parliament buildings. People walk through the Sunken Garden in Butchart Gardens near Victoria, British Columbia, Canada. Nikon D750/24-120VR, 1/125s, f/16, ISO 1000, EV 0, 24mm Focal Length. After photographing the Disney version of the Butchart Gardens in Epcot’s Canada pavilion since 1983, I visited the real thing which has 55 acres of beautifully landscaped gardens. 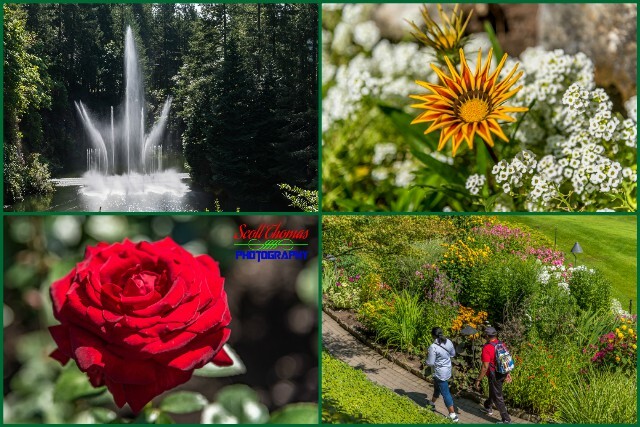 While not a big fan of photographing gardens, I was astounded by the real Butchart Gardens colors and workmanship of each of the five gardens and all the species of flowers. The Rose Garden has 280 varieties and 2,500 roses to give you an idea of the abundance of flowers. Butchart Gardens near Victoria, British Columbia, Canada. 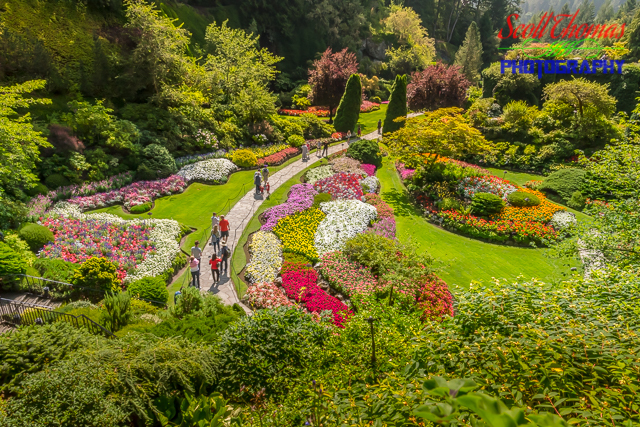 Give yourself about 3 to 5 hours for Butchart Gardens. If you stay for a night or more in Victoria, plan on taking in the nightly fireworks show at Butchart. 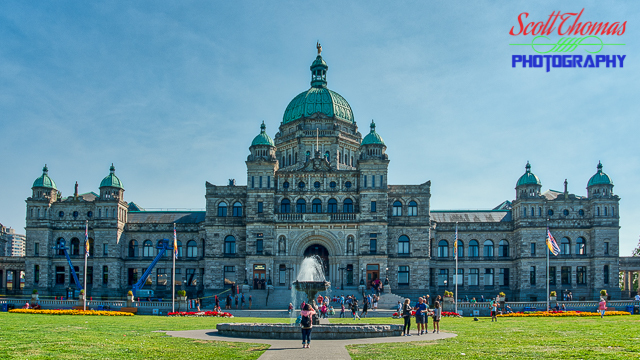 Parliament building in Victoria, British Columbia, Canada. Nikon D750/24-120VR, f/16, ISO 100, 24mm Focal Length, Skylum Aurora HDR 2018. The British Columbia Parliament Buildings are located in Victoria and are home to the Legislative Assembly of British Columbia. The buildings were built back in the late 1890’s in what is called a Baroque Revival architectural style. Knowledge Totem Pole carved by Coast Salish artist Cicero August outside the Parliament building in Victoria, British Columbia, Canada. Nikon D750/24-120VR, 1/125s, f/13, ISO 220, EV +0.6, 24mm Focal Length, Skylum Intensify CK. 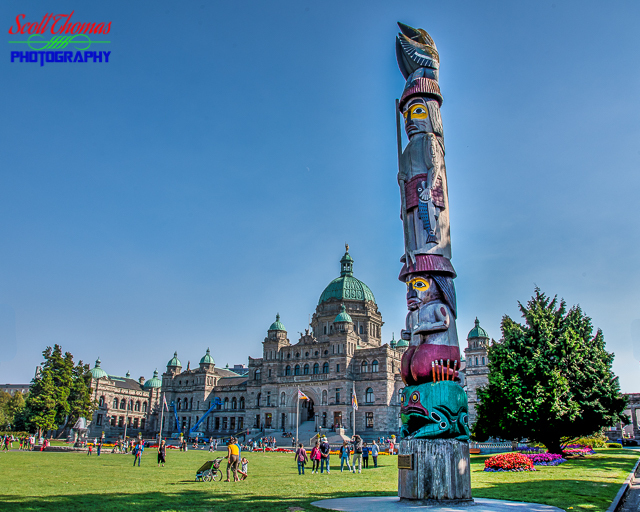 The Knowledge Totem Pole is a totem pole carved by Coast Salish artist Cicero August and was installed outside the British Columbia Parliament Buildings in Victoria. The pole was originally created for the 1994 Commonwealth Games. Fairmont Empress Hotel in Victoria, British Columbia, Canada. Nikon D750/24-120VR, 1/125s, f/16, ISO 220, EV -0.3, 66mm Focal Length. The Fairmont Empress Hotel is one of the oldest hotels in Victoria. Located on 721 Government Street, it faces the city’s Inner Harbour. The hotel was designed by Francis Rattenbury and built by Canadian Pacific Hotels, a division of the Canadian Pacific Railway company. The hotel first opened in 1908 and is presently managed by Fairmont Hotels and Resorts. The Empress was designated as a National Historic Site of Canada in 1981. I had tried all day to get a photo to show The Empress’ beautiful Châteauesque architecture and I found it as we were leaving on the Black Ball Ferry to return to Port Angeles. 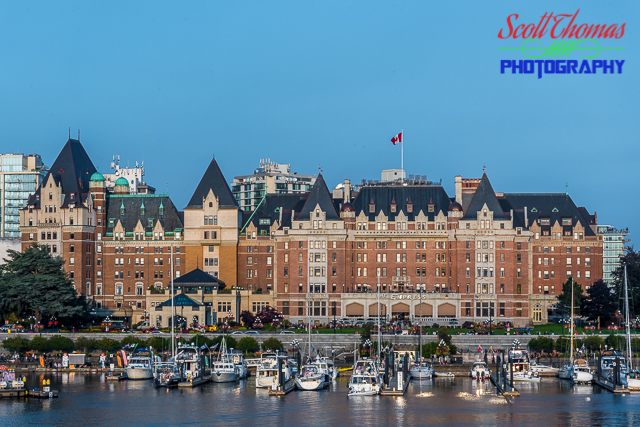 This entry was posted in Travel, Weekly View and tagged 24-120mm, aurora 2018, british columbia, butchart gardens, canada, carriage, empress hotel, flowers, hanging, harbor, harbour, horse, intensify ck, nikon D750, parliament building, skylum, totem pole, victoria, vr. Bookmark the permalink. Thanks for taking the time to share your travels with us. The photos are spectacular!